How do scholars share articles? Sharing of scholarly articles is widespread and increasing. The Beyond Downloads project (Elsevier) looks at scholars’ sharing behavior and what download counts are missing to better measure the reach —and impact — of a library’s resources. Find out more responses from 1,000 faculty members, researchers and PhD/master’s students. 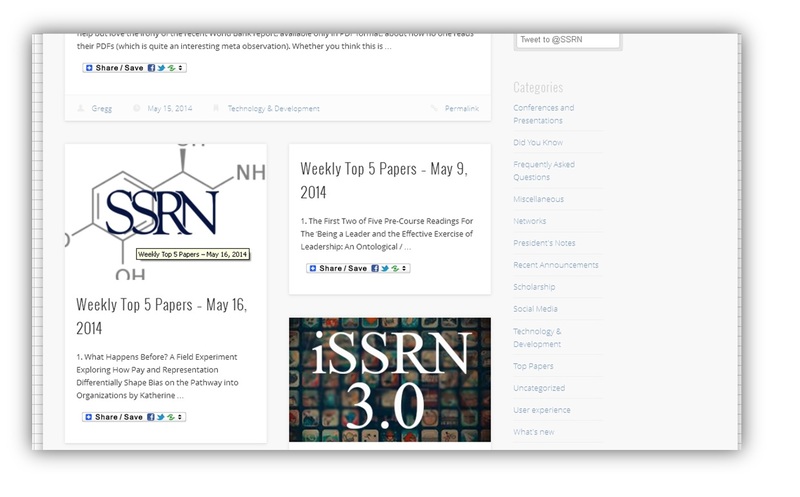 For the second time, the article Learning by Thinking: How Reflection Aids Performance, of which Giada Di Stefano is one of the authors, has been classed in the Weekly Top 5 papers of SSRN. Productivity and time efficiency are significant concerns in modern Western societies, with time being perceived as a precious resource to guard and protect. In our daily battle against the clock, taking time to reflect on one’s work may seem to be a luxurious pursuit. Though reflection entails the high opportunity cost of one’s time, in this paper we argue and show that deliberate reflection is no wasteful pursuit: it can powerfully enhance the learning process. Learning, we find, can be augmented if one deliberately focuses on thinking about what one has been doing. Results from our analyses show that employees who spent the last 15 minutes of each day in their training period writing and reflecting on the lessons they had learned that day did 23% better in the final training test than employees who didn’t take time to consider how they had approached the task. This improvement, we find, is explained by greater self-efficacy, i.e. confidence in one’s ability to complete tasks competently and effectively.